Sun, Sea, Sand and Spring! My last Blog described going to a Spanish Ski slope. Whilst the weather in Southern Spain was cold and wet in October and November (the rain is sorely needed) it has been sunny and dry for about 6 weeks or so. Down on the coast it can still be T shirts and shorts. Nature would appear to be slightly confused as to what time of year it actually is. Oranges, lemons and grapefruits are in season and peas and beans are growing well as we would normally expect to see. 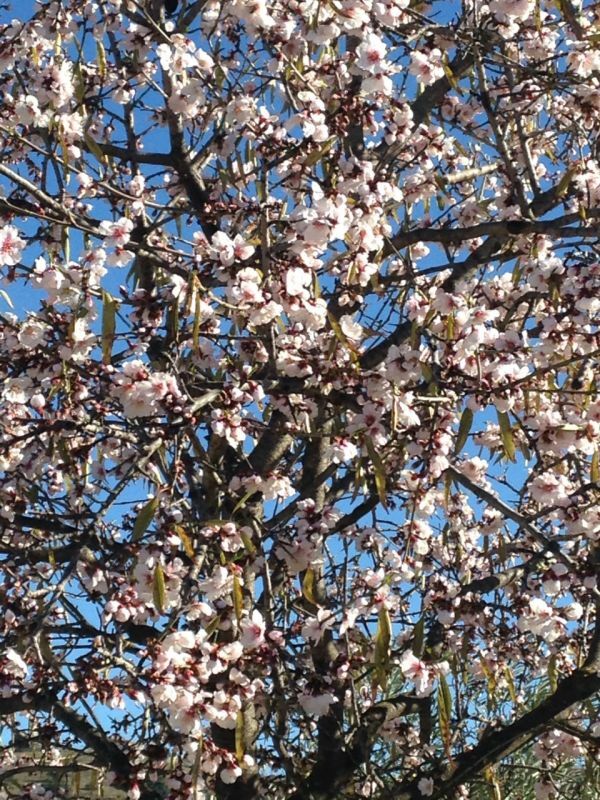 However, the Almond trees have blossomed and they are very pretty. I think they are about a month early. There is an explosion of shades of white and some pink on the trees. 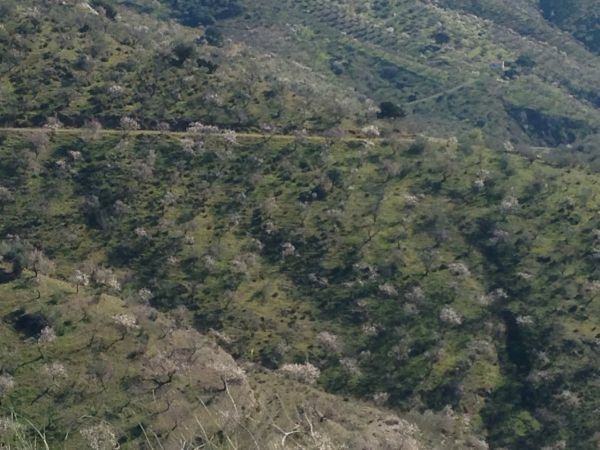 They are often grown amongst the olive trees and as you look across the valleys you can see what might look like little puffs of cotton wool on the hillsides. The trees are very low maintenance to grow, they need no watering. It takes 2-3 years before they produce any nuts but then they will produce a crop for the next fifty years! The blossom also produces a heady perfume. We have cold weather predicted for the end of this week which could include frost and very possibly snow so I hope the blossom and the trees don’t suffer. The almonds get harvested around August at the height of the summer. The husk or hull (known as a drupe) and nut are separated but nothing is wasted. The pod becomes animal feed or goes back on the land and we eat the rest. The process used to be very labour intensive but commercial growers now use tractors which lay a tarpaulin under the tree, shake the tree to release the drupes and gather them, they fold the tarpaulin and move onto the next tree.